While many people install hot tubs indoors, or on the patio, or even as part of a deck installation, I prefer to locate hot tubs and hot water spas in the garden. That way the tub becomes part of your landscaping scheme, and you really feel a part of nature while you soak in the warm bubbling water. I've had spas in two of my gardens, one located in a secluded corner and the other incorporated in the swimming pool design. But now I'm considering adding a gazebo for hot tub usage. While it's great to sit outside, a gazebo will extend the potential usefulness of the tub, because then I'll be able to use it in any weather conditions. I have to admit that I love soaking in a spa in the early evening, especially when it's drizzling very lightly. But it can be quite unpleasant in very hot or windy weather. By designing a gazebo for shelter over the next hot tub or spa, we'll be able to use it any time of the day, night or year. Your first decision will be whether to buy a ready-made gazebo, have one custom built, to buy a kit that you can put together yourself, or design and build your new gazebo from scratch. Your choice will depend both on the level of your construction skills and your budget. Gazebos come in a variety of shapes, sizes and styles. Even classical Victorian-style gazebos differ from one another. Although wood and metal (traditionally cast iron) are typical for the basic structure, roofs may be tiled, clad with corrugated metal sheeting, or even thatched. For authenticity, they should be freestanding and either a five-sided pentagon, a six-sided hexagon or octagonal in shape, in which case it has eight sides. A true gazebo is a type of garden room that has a view. It is also a feature in the garden, and one that is relatively small in size. 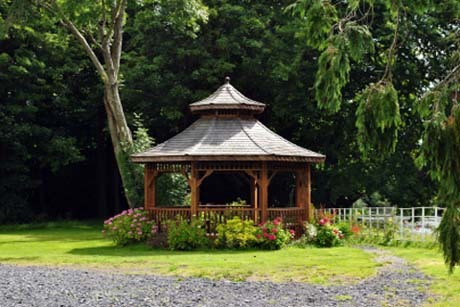 Larger gazebo-type structures, including those sometimes constructed in public gardens for concerts and other activities, are generally called pavilions. If you have the opportunity to construct your hot tub gazebo so that it captures a view, do so, but only if it doesn't result in a lack of privacy. While many famous garden gazebos were built at one end of the property, you don't need to copy this historic trend. After all, you want the gazebo and your hot tub to be easily accessible. Even my spa that was located in a secluded corner was just a few steps from the house. If you look at catalogues and manufacturers' photographs of garden gazebos, you will immediately see that you have an enormous choice. Some are made from wood, others from metal (including cast aluminum) and even vinyl – although there is also often a mixture of materials used. Some are intended for installation on solid ground, while others may be incorporated on an elevated deck. Roofing options range from asphalt shingles and cedar shake shingles to pine paneling. While many gazebo designs are open, others are enclosed, sometimes even with French doors and opening windows. These are a great idea for housing a hot tub because you get extra protection from the elements. It really depends how much shelter and protection you want. Of course just because you want to enclose your hot tub in some way doesn't mean that you need to erect a gazebo. One of the most effective enclosures for a hot water spa that I have ever seen, was a structure attached to a house. Very simple in design, it was a timber framework with glass panels and glass sliding doors. The equally simple roof structure was really just like any other pergola, but it sloped very slightly from the house (for drainage) and was topped with semi-transparent polycarbonate roof sheeting. The spa took pride of place in the centre of the outdoor room, which really was a garden room. The floor was made with precast concrete railway-tie lookalikes, laid with contrasting brown pebbles between them. Every corner of the room was planted with luxuriant ferns and other semi-tropical plants. Sitting in the spa – which could just have been a hot tub – you could see across a rural valley to striking mountains beyond. So if you are thinking about designing a gazebo for hot tub purposes, think laterally and make sure that the design really works for you. Planning on building a spa gazebo?